On the 30th, late in the evening, the Prelate returned to Panama after spending a day in Nicaragua. In his homily at Mass the next morning, he made reference to the day’s Gospel reading and encouraged those present to be light, salt and leaven wherever they are. After Mass, Lesbia gave the Prelate a rosary she made herself, using seeds for the beads. She said she had made a number of them to sell to those attending WYD, to raise money for scholarships for the Hospitality School where she works. Before leaving for the airport to catch his flight to Puerto Rico, the Prelate said to those accompanying him that he wouldn’t say good-bye, since in Opus Dei and the Church we are always united by the communion of saints. The Prelate arrived in Nicaragua early in the morning, for two catechetical get-togethers in Managua, in La Rivera and Villa Fontana cultural centers. Jenny, one of the young women studying in that center, said that she was helped to discover God there, since she wasn’t practicing any religion at the time. On 26 May 2018, when Nicaragua was undergoing a serious crisis, she was baptized, and her life was filled with a new hope. Sandra asked him to pray for unity and peace in Nicaragua. The Prelate assured her that he prays each day for this country, so that the people come closer to God and desire peace. José Luis is from Venezuela and is studying in Costa Rica. “I want with all my strength to return to my country and help my people.” The Prelate told him to pray a lot for Venezuela so that the hardships and violence are overcome. Laura, who is married, wanted to ask two questions. The first was about how to contribute to creating a culture open to life, and the second was how to speak to young couples about persevering in their marriages. The Father arrived in San José, Costa Rica, in the afternoon. Upon arrival at the Miravalles University Center, an Opus Dei residence where he will be staying during his time in San José, he greeted some families who were waiting there to welcome him. One of the families was from Ciudad Neilly, close to the border with Panama; another was from San Luis de Santo Domingo de Heredia and another from Curridabat, a suburb of the capital city. They were able to talk for a few minutes with the Prelate and he gave each of the families his blessing. Later on, Monsignor Ocáriz and a group of Opus Dei greeted some university students and also a group of faithful of Opus Dei who were waiting for him in the Guaitil Academy of Gourmet Cooking, connected to Miravalles. The Prelate went to the Entremares University Center, a center of Opus Dei close to Our Lady La Antigua Field, where many of the the main World Youth Day events were to take place. We need to desire “a permanent conversion,” he said. “Like Saint Paul, we find ourselves constantly facing our Lord, who tells us, ‘What are you waiting for? Why do you delay?’ Let us ask our Lord to make us react.” He also asked for prayers for persecuted Christians and for those facing special difficulties. 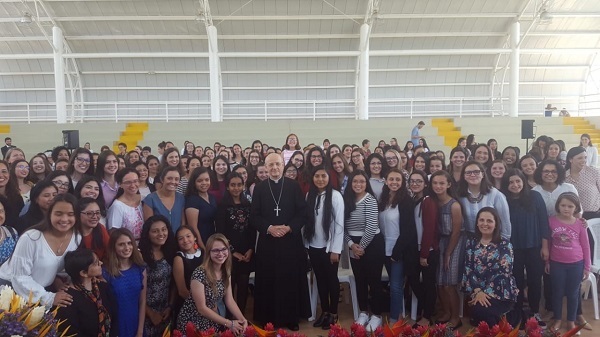 Monsignor Ocáriz then went to the Vasco Núñez de Balboa Conventions Center, where he had his first catechetical get-together during World Youth Day. At the beginning, he spent a few minutes with a group of young people from Venezuela. 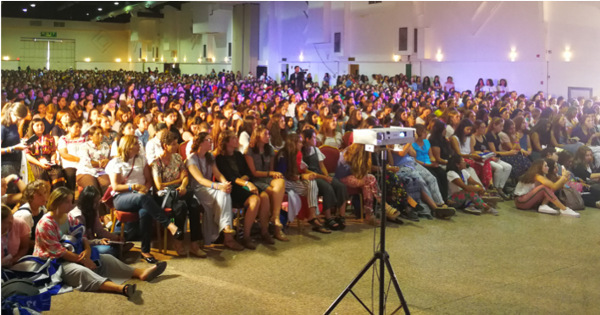 The first get-together was attended by over 1,500 young women from countries as far away as the Philippines. The young people received the Prelate with a special “wave,” making reference to the two oceans (the Atlantic and the Pacific) on either side of Panama. Right at the start, the Prelate asked for prayers for Pope Francis. He also spoke about joy, saying “our goal in life is to love God more each day” and that happiness awaits each one of us right where we are. Zugeilys, from Panamá, asked the first question. She was followed by María José (Colombia), Natalia (Brazil), Guadalupe (Uruguay), Sofía (El Salvador), Karin (Chile), Regina (Mexico), Tita (Guatemala) and María Gabriela (Brazil). Therefore “on our part, we have to reply ‘yes, I want to.’ Then we need to seek advice, to pray and to go as frequently as possible to the Eucharist.” He also spoke about freedom: “Because to commit yourself to something, you have to do it freely. Making a commitment is a way of exercising our freedom,” he reminded them. After receiving some families, the Prelate had another catechetical encounter in the afternoon. 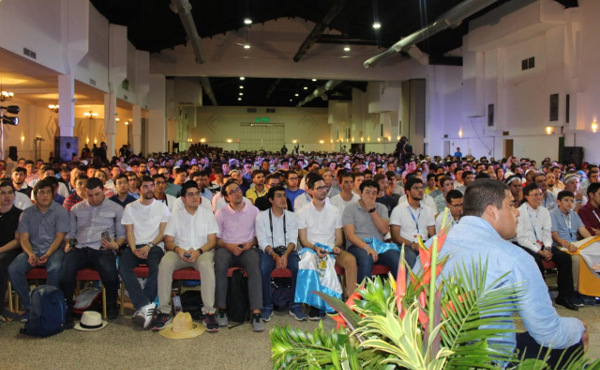 Over 900 young fellows, the majority from Central America, filled the auditorium. 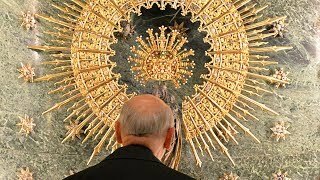 Upon entering the room, the Prelate stopped to speak with Gerardo, a young boy in a wheel chair who receives classes of Christian formation at a center of Opus Dei. Gerardo gave the Prelate a prayer card of Saint Oscar Romero. At the end, he was given as a gift a sombrero from Guatemala, World Youth Day wrist bands, and an image of our Lady. Monsignor Fernando Ocáriz landed on Thursday afternoon in the Tocumen airport in Panama. 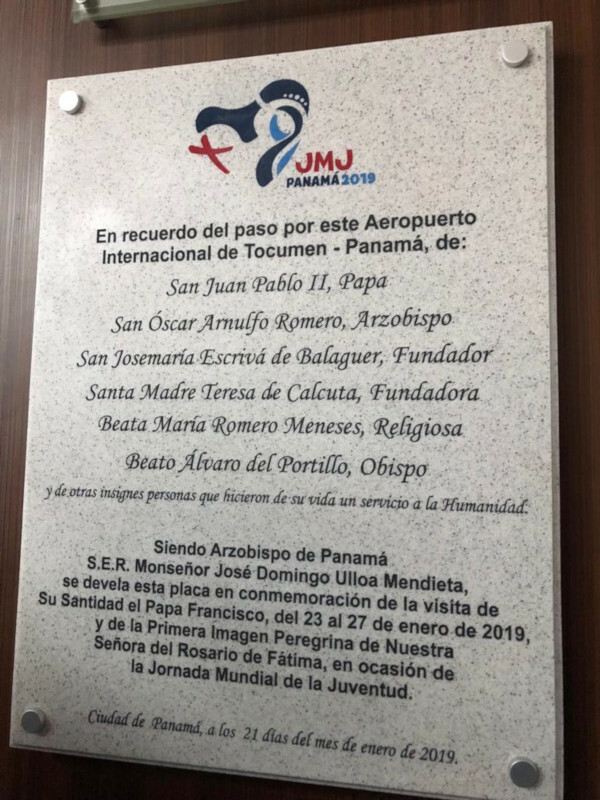 Some faithful of Opus Dei and World Youth Day volunteers accompanied him to the chapel, where a few days earlier a plaque was placed commemorating the various saints who have passed through the airport, including Saint Josemaria. The Prelate prayed before an image of the patroness of Panama, Our Lady La Antigua. From there, Monsignor Ocáriz made his way to the Cerro Azul conference center, located in the mountains near Tocumen. 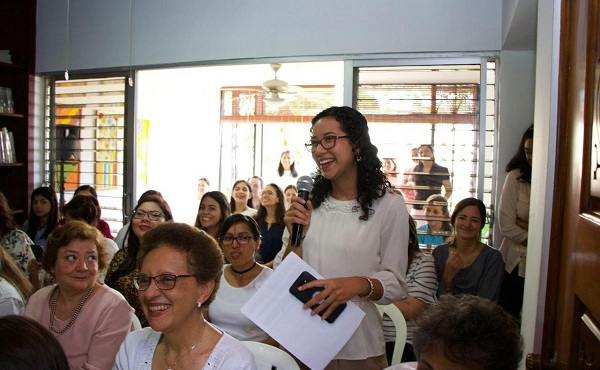 Upon arrival, the Prelate greeted the faithful of Opus Dei who were waiting for him at the Tagua Training Center, a center that promotes educational initiatives for women in the area. 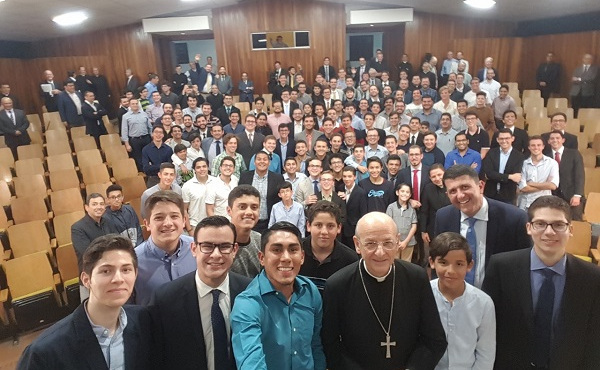 In Cerro Azul, the Prelate heard stories about the World Youth Day preparations, the Pope’s arrival, and the festive atmosphere among the young people in Panama during the past few days. 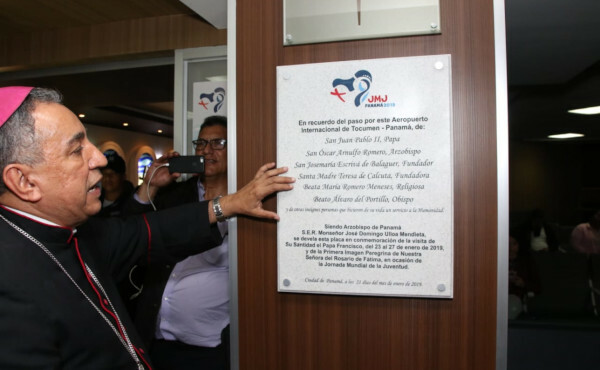 On Monday, a special plaque was placed in the Tocumen airport to commemorate the saints and blesseds who have visited the country and passed through the airport. The Metropolitan Archbishop of Panama, José Domingo Ulloa, was on hand for the installation, which included a small ceremony. “Now it will be remembered in our history that illustrious people have passed through this airport,” said Archbishop Ulloa. Saint Josemaria passed through Panama on his way to Guatemala in 1975. He was traveling from Venezuela during a catechetical trip. In February 1975, a few months before his death, Saint Josemaria traveled from Venezuela to Guatemala and the plane made a stop in Panama. The apostolic work of Opus Dei in Panama did not yet exist (it began in Panama in 1996). Blessed Alvaro del Portillo accompanied Saint Josemaria on this trip.